I decided to move away from WordPress.com and created an Octopress blog. The new URL is http://shishkin.org. I won’t migrate any content from the old blog, it all stays here for the record in the read-only mode. Subscribe to my feed if you haven’t done so yet. The feed is powered by FeedBurner and should remain stable. Last week I attended and have spoken at OOP 2012 in Munich. It was overall great experience and unfortunately, as at each top conference, I often had hard times deciding which session to attend. I learned a lot from thought leaders like Johanna Rothman, Diana Larsen, David J Anderson, Jurgen Appelo, Matthias Bohlen, Stefan Tilkov and many more and probably missed some really great sessions and discussions as well. I also used the chance and met my friends in Munich – it was a great time. My session was titled “REST: you’re doing it wrong” or “REST, du machst das falsch” in German. It was a significantly revised version of the talk I gave at NRWConf 2011 in Wuppertal. This time I enhanced the story a little bit as well as overhauled the whole presentation. I used imress.js framework to create an HTML5 presentation to be shown in browser – no special slideware needed. I very much like the result, though I gathered somewhat mixed experience achieving it. It was particularly troublesome to arrange all the presentation steps on the canvas while working in pixel units. Maybe some layout plugin or template language would help. The presentation also doesn’t work well in all browsers. From the presenter’s standpoint it ok: it works smoothly in Safari on a Mac, but for publishing online it’s a major drawback: Chrome on a Mac has performance and rendering issues while current stable Firefox is not supported altogether. Anyway these issues will be ironed out sooner or later and I’ll probably stay away of any PowerPoint-inspired slideware from now on. I started the talk with the ironic tale of the ice-cream maker written by Sebastien Lambla. After that I continued with fundamental architectural decisions made by the creators of the Web and upon which REST as an architectural style is based. Then I moved to common misinterpretation of REST, like claiming that not using SOAP or using JSON for serialization is already RESTful. After that I introduced Richardson REST Maturity Model and started moving the story towards a RESTful system. First, I talked about resources and their identifiers. It was also important to mention the distinction between resources and representations. It was then obvious that using URI is inappropriate way of specifying a representation (like the API version or language being part of the URI). I then mentioned the importance of understanding HTTP mechanisms and assumptions it makes against different methods. The most common pitfall in RESTful systems design is from my perspective to stop on that stage and build a CRUD (Create Read Update Delete) service. Though CRUD certainly has its application domain, nonetheless it’s inappropriate for most of the business systems, as the application logic remains outside of the application – like an Excel spreadsheet, where the user just edits raw data instead of fulfilling business tasks. The natural step from a system designed out of HTTP methods is a system designed out of resources, where each business task is a resource. This is almost the same principle we use for ages building web applications. Such a system can leverage well-known mechanics of hyperlinks and forms to provide a truly RESTful API. The HTML5 presentation is available on GitHub pages. You can also be interested in the previous PowerPoint version with speaker notes over at Slideshare. Update: There is also a ~5.8 megapixel poster of the overview slide in PNG format if the impress.js version doesn’t happen to work for you. As a good tradition every other month .NET User Group Rhine/Ruhr organizes a coding dojo in Ratingen. This time we get more interactive and learn TDD as if you meant it altogether in pairs. If you are around and want to join us, you’re welcome! It consists of two days of highly collaborative interactions, including Lightning Talks (on Thursday evening), scheduled sessions (on Friday), and a self-organized Open Space (on Saturday). The event will be much like a retreat. We will be there for 48 hours to collaborate and share ideas. I will present practical experience with Specification by Example, I gathered working with an agile team back in 2010. Gojko Adzic has written THE book about Specification by Example, which I highly recommend. Want to discuss this topic? Register for SoCraTes 2011! It is a great honor for me to be part of this year’s line up of speakers at NRWConf. 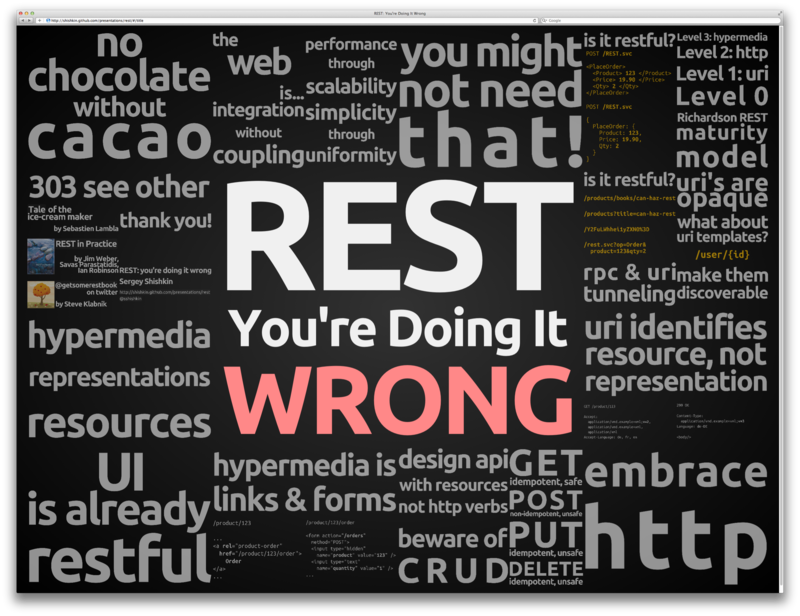 My session on REST is focused on why is true REST so much different than WS-* and CRUD POX services. Want to avoid common mistakes and leverage the web platform, join me in Wuppertal. Austrian .NET community hijacked Greg Young for a day to speak about all things CQRS. I just can’t miss such an opportunity to see hilarious Greg speaking, neither should you! As part of the event I will be speaking about NOSQL and why it is becoming even more attractive for separated read and write data models. This year’s prio.conference is focused on cross-platform development and I think that the web platform is currently the closest realization of that vision. That’s why I was so excited, that my talk proposal about “getting REST done right” was accepted. In contrast to my NRWConf REST talk, this one is focused more on concrete examples of how to get things done following the REST way, rather than pointing at failures and pitfalls. So, next months are going to be tough, but I look forward to meet bunch of interesting people and be inspired and energized by the community! Last month we had a coding dojo on a user group meeting in Ratingen. This was the first coding dojo for most of the user group members and I was allowed to facilitate it. As a big fan of Ilker’s style coding dojos for his entertaining talent I wanted to deliver an energizing experience to the attendees if anything at all. So instead of throwing people at kata right away and watching them arguing which unit-testing framework to use I decided make a “demo of a coding dojo”. Imagine yourself sitting in a racing car having never seen a race and knowing only how to ride a bicycle. Now go on and have fun on a track. Two hours later you already can start the engine and release the handbrake. Was it fun? Will you come next time to learn how to shift gears? I doubt. Now Imagine somebody took you for a drifty ride. Now it makes sense! Now there is even a point to learn it yourself. The same way I learned to love coding katas: by watching masters (like this one) doing them. I choose a modified version of the String Calculator Kata: instead of just adding numbers joined to a string, I aimed to implement an arithmetic expression evaluator (“1 + 2” –> 3). My tools for this kata included VS2010, C#, Resharper, xunit.net as testing framework, and Should as a fluent assertions library. The first feature was to evaluate a decimal constant. The simple “double.Parse(expression)” method did the trick. It definitely doesn’t take parenthesis into account, but it quite elegantly solves four arithmetic operations with operator precedence and more than two arguments and more than one operator per expression. Without using Linq I would probably go with a bunch of if/else statements being than refactored into an expression parser and an expression tree evaluator (which is a way to go for supporting parenthesis). Anyway for the first iteration I implemented all the features I wanted and ended up with very little code, which I don’t mind to throw away if it doesn’t fit anymore. And this is a true virtue of TDD. The next Coding Dojo at the User Group Rhine/Ruhr will be on 27th April, hosted by MT AG in Ratingen. Follow announcements of the UG or sign up at Xing. Yesterday I faced a quite annoying limitation of Silverlight (and of its Windows Phone 7 variant). Due to the lack of cross-assembly private reflection Silverlight’s Data Binding is unable to bind to explicitly implemented interface properties. No, I wasn’t jail-braking the phone, all I wanted to do was to bind some hierarchical data control to a LINQ Grouping. Unfortunately IGrouping<TKey,TElement> is implemented in .NET not just by internal classes (as usual, ARRRGGHH!!!) but in addition explicitly. Fine! Others confronted with the same problem gave up by writing a public wrapper class exposing a public Key property, binding-ready. Although that solution worked I felt wrong polluting all the queries in my view model because of Silverlight data binding limitations. Another interesting approach proposed by Christopher Bennage on Stack Overflow used a Value Converter to get the Key property of a grouping. Now it looked much better in terms of separation of concerns, but the converter was hard-coded to work with IGrouping<string, MyDomainClass> only. Remember? No cross-assembly private reflection. LINQ expression tree code generation didn’t work without Reflection.Emit. So after pulling some hair out of my head I found a rather simple solution. The Key property on the interface itself is obviously public. It is indeed possible to use reflection to get the property value if only you use a PropertyInfo from the interface, not from the implementing type. Recently I moved my blog away from Live Spaces to WordPress.com. I remember myself a few years ago comparing Live Spaces and WP among other blogging platforms, I bought in to Live’s tight integration of the blog engine, the SkyDrive and the Live Writer. That was definitely not my best decision as recently Microsoft announced that they are discontinuing Live Spaces and all users are kindly requested to move their blogs to WP. The migration procedure took just several clicks and I got my whole blog with all the comments on WP. One thing I missed after Live Spaces however was custom domain redirection. I want my domain – shishkin.org to point to my blog, but this is a premium feature at WP that costs money. After no luck with DNS configuration at my registrar I headed to cloud solutions. And here comes Heroku. Heroku is a ruby hosting platform in the cloud, which is free for small demands and feature rich, rock-solid and scalable when you need it. So I decided to build and host at Heroku an absolutely dumb HTTP Ruby application that should redirect all the requests to my blog at WP. Thanks Heroku Custom Domains I was able to host my small dumb app for free with my custom domains (shishkin.org and www.shishkin.org). That’s it! Using simple Heroku documentation I was able to build, test and deploy my little app in minutes. Heroku’s git-based deployment is somewhat cool. It just can’t be simpler given that each Ruby developer probably has git installed already. As for Rack, I think it’s an awesome framework we really miss in .NET. After being intrigued by Rack’s ultimate simplicity and extensibility I watched TekPub’s episode on Rack and started to watch the Sinatra series. Now I’m intrigued even more Rob Conery does a great job of getting .NET developers out of their comfort zone and provoking us by showing how simple software development can really be on the other side of the fence. To summarize, I finally did something productive with Ruby! I solved my real-world problem (not that big for sure), I solved it simple, fast and elegant. And I learned a lot along the way.